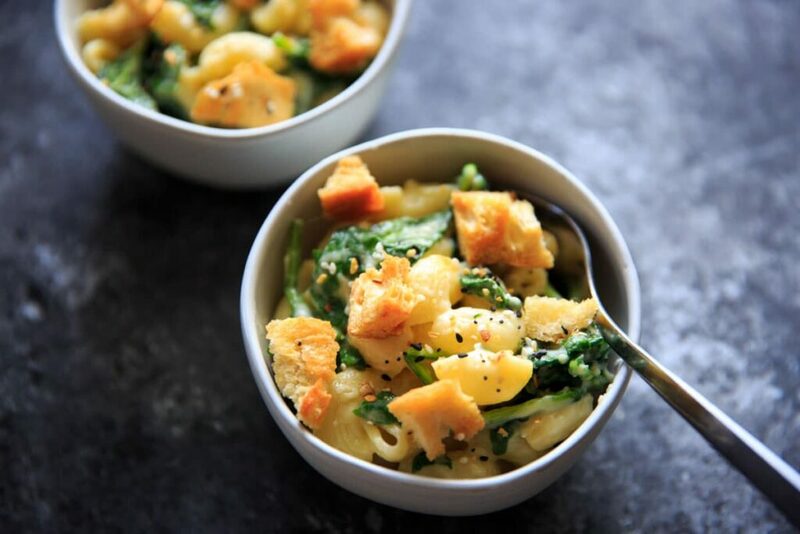 White Cheddar Macaroni and Cheese with Spinach and “Everything Bagel” seasoned croutons. 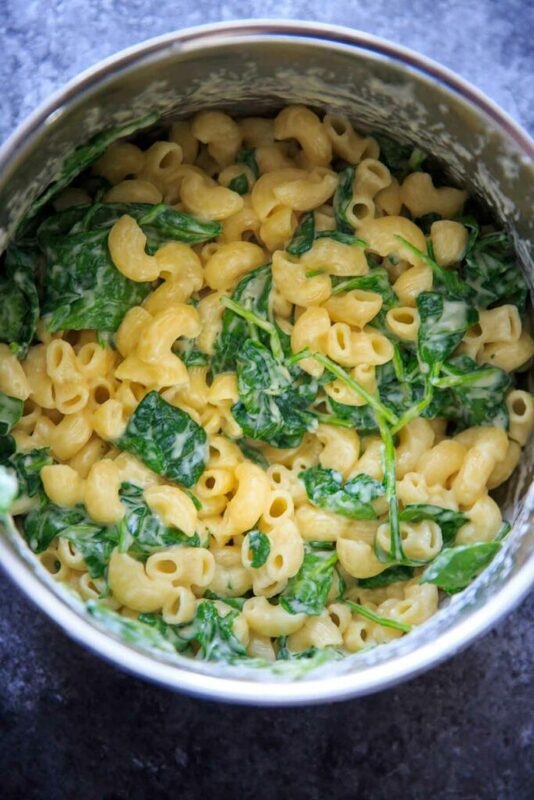 A delicious and unique spin on mac and cheese that comes together surprisingly quickly – in under 30 minutes! This flavorful combo sneaks in veggies and is sure to be added to your meatless dinner rotation. I’m talking to you AND this mac and cheese. Well, I’m talking to you if you a.) like macaroni and b.) LOVE everything bagel seasoning. Because as promised, here is the reason I made those everything bagel croutons. Another shout out to my cousin Sam over in Boston, who is the source of inspiration for this recipe. She told me about the “best mac and cheese ever” that she had on vacation, the main points being it had white cheese, and everything bagel croutons. 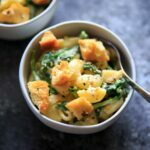 You can make the croutons in the oven at the same time that you make the macaroni on the stove, and it will be ready in less than 30 minutes. Maybe even 20 minutes! The spinach was a last minute decision, and I think it was a very good one. Since I seem to like to sneak veggies into my macaroni and cheese recipes, it was fitting. Spinach wilts so easily so I didn’t even cook it first. I just mixed it in after the macaroni and cheese was done (and still hot). 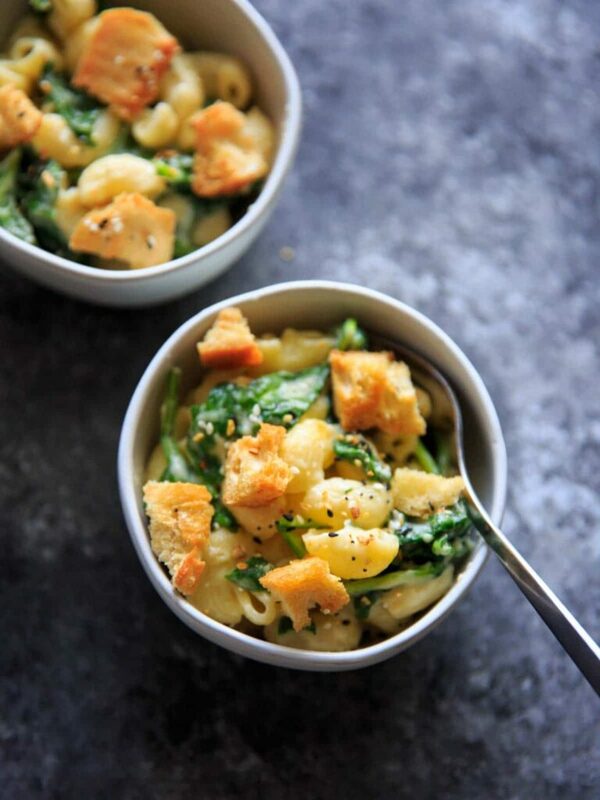 Did I mention it only takes 6 ingredients for the pasta, and just 3 more for the croutons? That’s assuming you have the seasoning blend already. 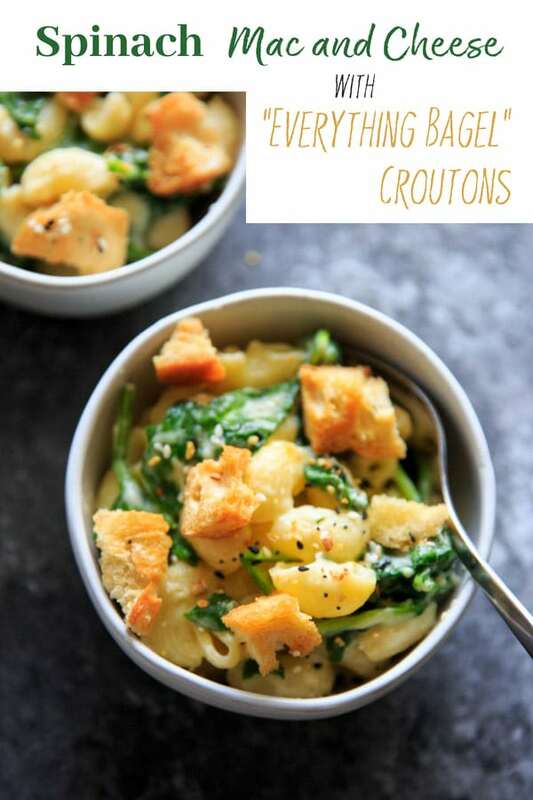 I like to add more “everything but the bagel” seasoning on top of the pasta so that you get extra bites of flavor, not just when you get a crouton! 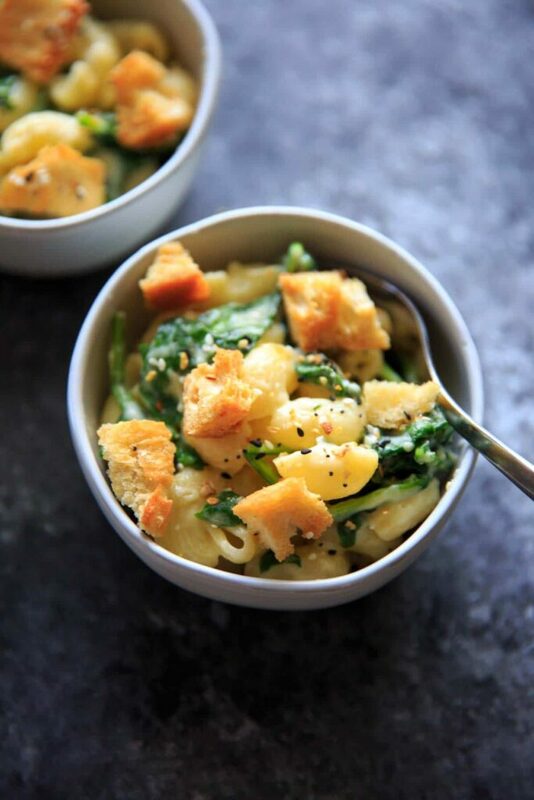 White Cheddar Macaroni and Cheese with Spinach and "Everything Bagel" Seasoned croutons. 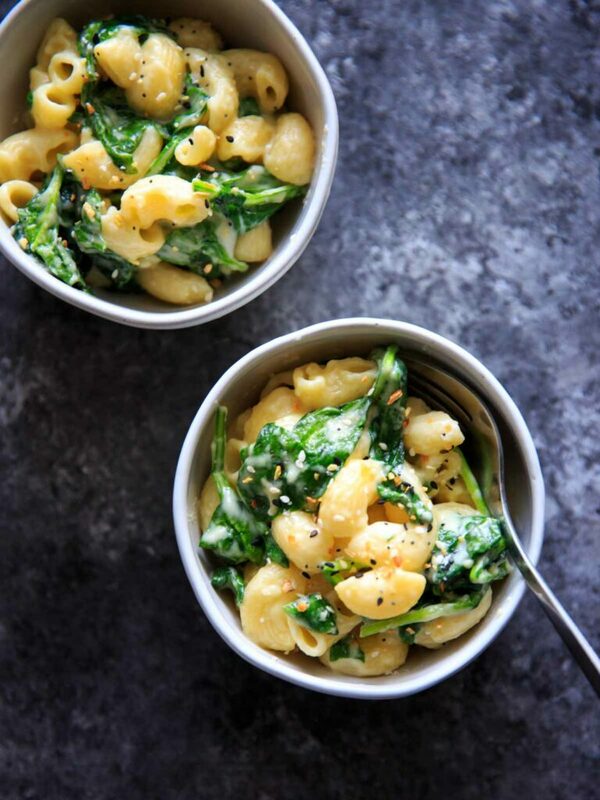 A delicious and unique spin on mac and cheese that comes together surprisingly quickly - in under 30 minutes! This flavorful combo sneaks in veggies and is sure to be added to your meatless dinner rotation. 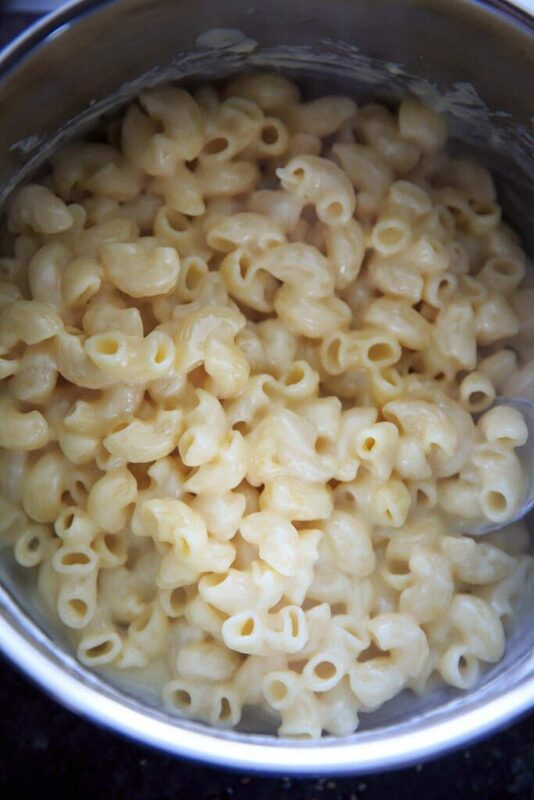 In a large pot, cook macaroni according to package instructions (usually around 8 minutes in boiling water) and drain. Meanwhile, in a medium pot melt butter over medium heat. Whisk in flour for a couple minutes until thickened. Add milk and stir in for a couple more minutes. Add cheddar cheese (I cut mine in small slices first so it would melt easier) and whisk until melted. Add in macaroni to cheese mixture and stir to combine. Remove from heat, add in two large handfuls of baby spinach and mix, allowing the spinach to wilt from the heat. Top with everything bagel spice and everything bagel croutons! Everything bagel spice can be made with equal parts (1 teaspoon of each, for example) of poppy seeds, sesame seeds, no-salt-added garlic powder, onion powder, and kosher salt. *Calories do not include the everything bagel croutons. Grab the everything bagel spice in the Trial and Eater amazon shop.